We recommend checking out our discussion threads on the Sony LMD-2110W 21.5" Professional LCD Monitor LMD-2110W, which address similar problems with connecting and setting up Production Monitors Sony. The user manual for the Sony LMD-2110W 21.5" Professional LCD Monitor LMD-2110W provides necessary instructions for the proper use of the product Professional Video - Monitors - Production Monitors. The Sony LMD-2110W is a 21.5" professional LCD monitor that's capable of tackling a wide range of viewing scenarios. As a cost-effective, entry level unit, this multi-format display is ideal for industry professionals interested in achieving CRT-level performance without giving up the space-saving benefits of a flat panel screen. Equipped with a wide array of video inputs, the LMD-2110W provides both analog and digital connectivity unparalleled in its price range. Inputs such as component, composite, and HDMI ensure the panel will perform in almost any SD or HD environment. This monitor can also handle SD-SDI input using an optional BKM-320D SD-SDI input adapter. At the same time, its combination of RGB color filters and 10-bit signal processing provide stunning images with bright whites, saturated colors, and a smooth, CRT-like gamma. Add in a VESA standard mount with 100mm pattern--for simple wall installation--and you've got a pro monitor that will be right at home in a range of HD applications, including entry-level video editing, surveillance, and studio monitoring. If you own a Sony production monitors and have a user manual in electronic form, you can upload it to this website using the link on the right side of the screen. Box Dimensions (LxWxH) 24.5 x 20.0 x 12.5"
The user manual for the Sony LMD-2110W 21.5" Professional LCD Monitor LMD-2110W can be downloaded in .pdf format if it did not come with your new production monitors, although the seller is required to supply one. It is also quite common that customers throw out the user manual with the box, or put the CD away somewhere and then can’t find it. That’s why we and other Sony users keep a unique electronic library for Sony production monitorss, where you can use our link to download the user manual for the Sony LMD-2110W 21.5" Professional LCD Monitor LMD-2110W. 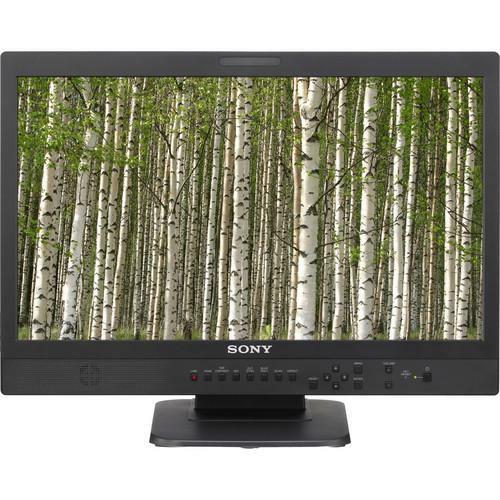 The user manual lists all of the functions of the Sony LMD-2110W 21.5" Professional LCD Monitor LMD-2110W, all the basic and advanced features and tells you how to use the production monitors. The manual also provides troubleshooting for common problems. Even greater detail is provided by the service manual, which is not typically shipped with the product, but which can often be downloaded from Sony service. If you want to help expand our database, you can upload a link to this website to download a user manual or service manual, ideally in .pdf format. These pages are created by you – users of the Sony LMD-2110W 21.5" Professional LCD Monitor LMD-2110W. User manuals are also available on the Sony website under Professional Video - Monitors - Production Monitors.